The Solution to End Binge Drinking for Life! You’re about to discover how to finally gain control over binge drinking, curb alcoholism, and improve your quality of life in the process. Each and every day, so many good people go out to a party or a night on the town with friends and accidentally overdo it with their alcohol consumption. You or someone close to you has felt the effects of this mistake time and again: the loss ofÂ memory, the embarrassing photos, the terrible hangover, and possibly an aftermath of destruction that binge drinking has caused to your life or the lives of others. Finally, there’s a way to help you put a stop to it while still continuing to enjoy alcohol with friends and family – the safe and responsible way. 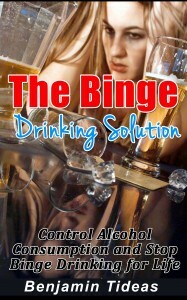 Keep in mind, this is not a book for convincing you to stop drinking, but an easy to follow guide using strategic techniques to help you curb your alcohol intake and get a handle on binge drinking once and for all!